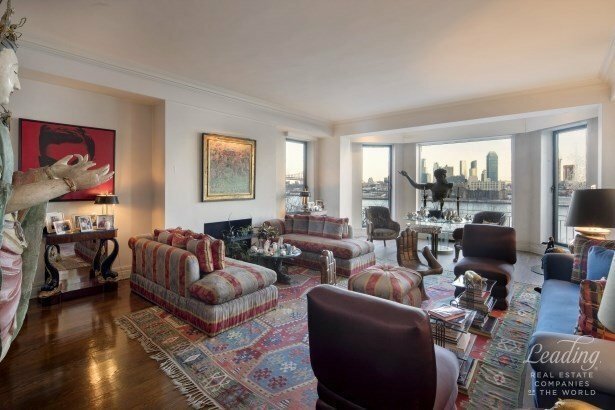 Magnificent duplex with 200 feet of stunning East River views in one of Manhattan's top, white-glove co-ops located in exclusive Beekman Place. This twelve-room home has four bedrooms and four and a half baths. One enters the apartment through a grand entry foyer with a large powder room nested under a sweeping staircase leading up to the private quarters. Radiating off the entry hall is the thirty-foot corner living room and adjacent library. Both rooms have direct river views, Juliet balconies and fireplaces. The expansive formal dining room leads into a large eat-in kitchen with butler's pantry. Down the hall is a service stairway, staff quarters and wine cellar. Four luxurious bedrooms are on the upper level including an large corner master suite with wood burning fireplace, dressing room and elegant bath. Adjacent to the master are three additional bedrooms with ensuite baths and copious walk-in closets, a home office and laundry room. Unique building amenities include : state-of-the-art fitness center, Olympic sized swimming pool, beautiful riverfront garden, in-house garage. Club party rooms for entertaining with a service kitchen, golf simulator and basketball court. 24-hour doorman and attended elevator. Pets allowed.